Good Monday morning to everyone! What was your weekend like? We started ours last Friday and it will end on Thursday (loooong weekend!) because we are celebrating Carnival here in Brazil. 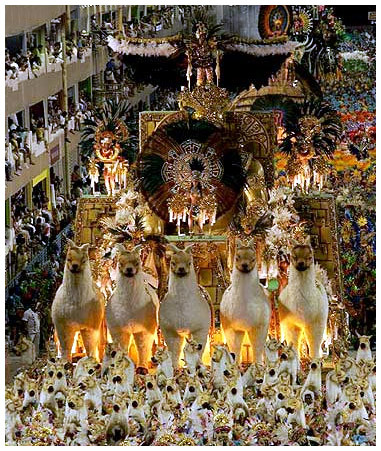 As you surely know, and though this sounds like an oxymoron, Brazilians take Carnival very seriously. The Escolas de Samba work hard during the whole year preparing the costumes and carriages and getting in shape to dance non stop for hours and hours. The amount of people who come here from all over the world to see this annual tradition is impressive. People often tell me how lucky I am to live here so I can go to the Sambodromo (parade stadium which can hold 70,000 people) every year to see the show. Well, yes, I am very lucky to live here but not because of the Carnival. I have never been to the Sambodromo and never will. I shy away from crowds. Everything is very organized and there is no danger but nevertheless I don't like crowds. I'm happy to watch the parade on TV so I can admire the carriages and costumes but that's it! Here are a couple of photographs to show you what it's like. And now let's go on with our business. Want to go shabby chick? These photographs from Coastal Living show you how to get that look. In this kitchen, a weathered table serves both as an island and dining table. A pink chandelier adds a feminine touch and emphasizes the hint of pink paint on the table. For a similar look, paint a wood piece, then sand rigorously once dry. The homeowner filled this living room with "regal rejects and relics." She revived many items with a coat of off-white paint, which keeps the look loose and light. With patterned slipcovers and painted furniture, this Old Florida cottage is clean yet playful. Mixing stripes, checks, and florals is key to the relaxed style. Designer Janice McCarty layered several shades of blue adding depth to the small room. To achieve this look, the designer combined multiple textures—board walls, weathered wood, and quilted fabrics. Mostly monochromatic, this bedroom combines several shades of white. A few pastel accessories add interest. So, what do you think? Could this be your style? I love the Shabby Chic style!! I love Shappy Chic but some of the pics are a bit too much over the top for me, at least when it comes to actually living in the rooms. I adore the first pic though! I hate crowds too : one of the reasons why I never saw the military parade of Bastille day in Paris. Too many people on the sidewalk, and too many frightening people on the street too ! I LOVE the bed in the last pic. And the canisters on the shelves in that picture are pretty covetable as well. Very lovely pics. I'm definitely into the shabby chic style! The carnival picture is quite amazing! I'd be with you on the sofa, though. Crowds don't do it for me either. Thanks so much for all your kind comments! And felice carnevale! Hey loveisallaround, I just went to your blog and I tried to leave a comment but I couldn't find "comment" link, nor could I find your email address. After your posts there is a long line which crosses out the part where you click to add a comment. Maybe it's just my computer. I hope your grandmother is better. All the best for her!